The latest versions of Microsoft Office and OpenOffice lead the market in their sector, and they both have their own default format to save their files, DOCX for Microsoft Office and ODT for OpenOffice, two formats that are very extended, but that can sometimes be a nuisance instead of help. On the other hand, the RTF format is much simpler, clear and it has the basic and necessary options to create and edit texts. That is why on some occasions people prefer the simplicity of RTF (Rich Text Format) to the enormous possibilities that DOCX and ODT offer, that is why NW Docx Converter (also called, Docx2Rtf) has been developed to easily convert any DOCX or ODT file to RTF. 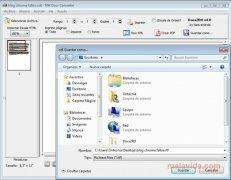 The Microsoft Office and OpenOffice files include various directives that are not visible to the user but that are processed if they are read by a program, and they sometimes corrupt the file. That is why utilities like NW Docx Converter can come in very handy in many circumstances. What's more, NW Docx Converter can print any supported file from the application with many options available, among which you will find the option to print to PDF. It is necessary to have a ZIP compatible compressor.